So, I have decided to set my instagram account to private..
Because... There are actually a few reasons..
1) People whom I don't know have been commenting on my posts which is annoying. 2) I can have the freedom of posting whatever pictures I want. I know publicity is good since I aspire to share my life through the snippets of pictures but I get judgmental remarks just based on what I post. Like come'on, my own instagram you care about what? I'm not trying to sound like as if I am a big f with 900+ followers. I just want to get across that I do not post for the sake of your preference. 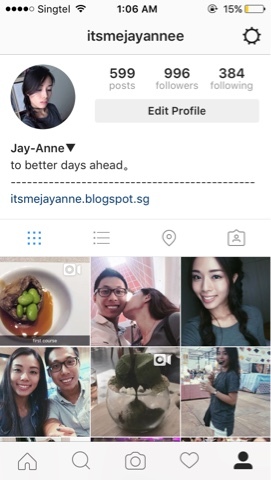 In case, if you are wondering, I would never follow what other instagrammers do just to gain popularity or likes. I have to admit I used to compete and get obsessed about having less or more likes so I will post irrelevant stuffs which I do not really feel very happy about it because it was not a genuine post. So don't worry, I still and will love myself.